In this project, fatigue of the human body is considered from the muscle coordination viewpoint and the electromyography (EMG) view point, respectively: In the former viewpoint, a “load-distributed” muscle control scheme has been contemplated. In our method, a set of linear equations is derived by connecting the acceleration description in both joint and muscle space where the pseudo inverse solution to these equations provides an initial optimal muscle force distribution. Thereafter, we redistribute the forces throughout the muscles by deriving a gradient direction for muscle force. This allows the muscles to satisfy force constraints and generate a distribution of forces throughout all the muscles. Moreover, to ensure that our proposed method is adaptive to modeling errors, we have constructed an estimated system model, which is added to the system to represent the real plant. By updating the parameters of the estimated model based on prediction error, the estimated model approaches the real plant gradually in real-time. In the latter viewpoint, a method to access the overall fatigue of human body movement has been proposed. According to the previous research regarding localized muscular fatigue, a linear relation is assumed between the mean frequency and the muscular working time when the muscle is experiencing fatigue. This assumption is verified with a rigorous statistical analysis. Based on this proven linearity, localized muscular fatigue is simplifiedas a linear model. Furthermore, localized muscular fatigue is considered a dynamic processand, hence, the localized fatigue levels are tracked by updating the parameters with themost current surface electromyogram (sEMG) measurements. Finally, an overall fatiguelevel is computed by fusing localized muscular fatigue levels. Haiwei Dong, Nadia Figueroa and Abdulmotaleb El Saddik, “Adaptive ‘Even-Load-Distributed’ Muscle Coordination Method for Kinematically Redundant Musculoskeletal Humanoid Systems,” Elsevier Robotics and Autonomous Systems, vol. 64, pp. 59-69, 2015. Haiwei Dong, Izaskun Ugalde, Nadia Figueroa and Abdulmotaleb El Saddik, “Towards whole body fatigue assessment of human movement: A fatigue-tracking system based on combined sEMG and accelerometer signals,” Sensors (Basel), vol. 14, no. 2, pp. 2052-2070, 2014. 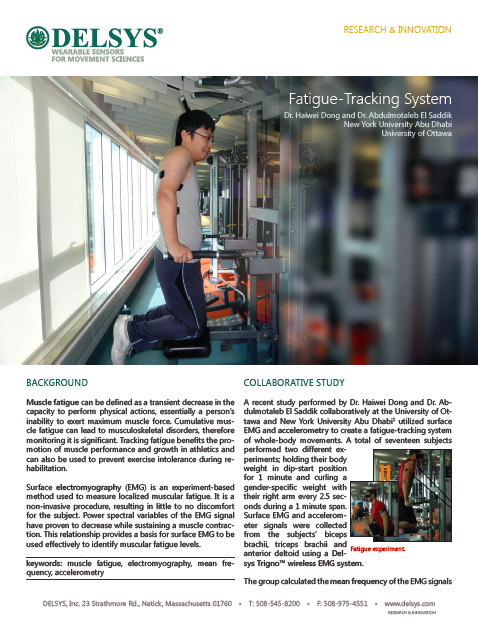 Haiwei Dong, Izaskun Ugalde and Abdulmotaleb El Saddik, “Development of a fatigue-tracking system for monitoring human body movement,” in Proceedings of IEEE International Instrumentation and Measurement Technology Conference (I2MTC 2014), pp. 786-791, May 12-15, Montevideo, 2014. Haiwei Dong, Setareh Yazdekhasti, Nadia Figueroa and Abdulmotaleb El Saddik, “‘Anti-Fatigue’ Control for Over-Actuated Bionic Arm with Muscle Force Constraints,” in Proceedings of IEEE/RSJ International Conference on Intelligent Robots and Systems (IROS 2013), November 3-8, Tokyo, pp. 335-342, 2013. Haiwei Dong, Nadia Figueroa and Abdulmotaleb El Saddik, “Muscle force control of a kinematically redundant bionic arm with real-time parameter update,” in Proceedings of IEEE International Conference on System, Man, and Cybernetics (SMC 2013), October 13-16, Manchester, pp. 1640-1647, 2013.